Remember that great old Buffalo Springfield song? Well those were the lyrics that started going through my head as I spotted this scene unfolding tonight in the long-vacant retail space in City Hall, at the SE corner of 2nd Street / Willie Nelson Blvd and Guadalupe. What I do know is the sweet vibe of SXSW is definitely in the air all around Downtown on these 80-degree late February days. The countdown is on: only 16 more days til Austin starts rockin’ off its hinges! And I don’t just mean with music… but also energy, enthusiasm, innovation, creativity, knowledge, adventure, technology. 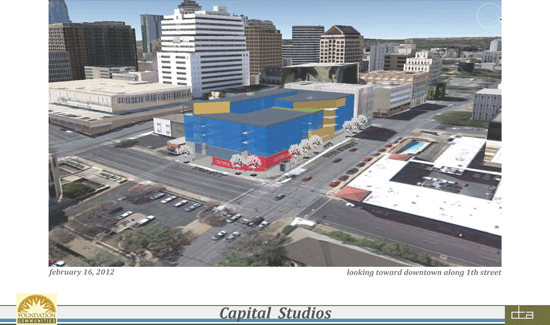 It’s a week when we all can really visualize Austin’s future as a global creative capital. 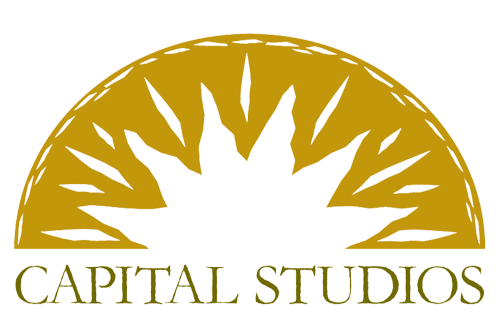 Foundation Communities’ proposed downtown Austin affordable housing development will no longer be referred to as Capitol Terrace, but rather Capital Studios. Yes, the spelling is correct. 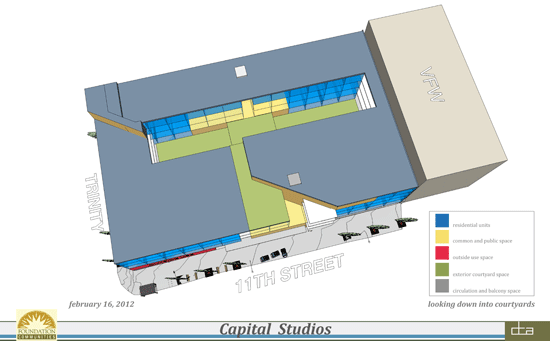 DAB has obtained draft drawings of the development at 11th & Trinity. 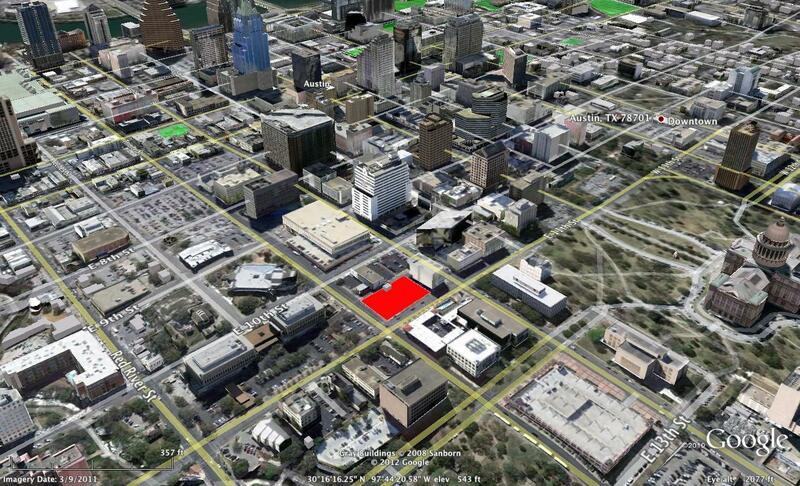 These are intended to show massing and different uses within the building. 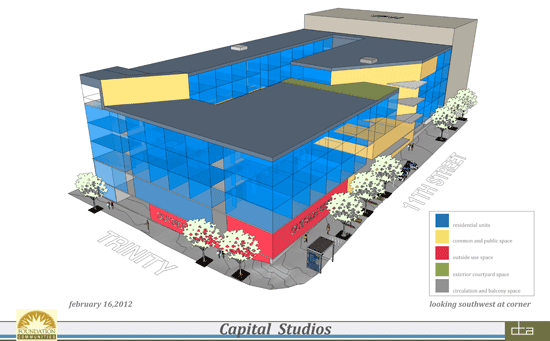 There might be small changes to the final design – the colors are for clarity and do not represent how the skin of the building will look. With the proposed Foundation Communities development needing support of the neighborhood, DANA invites its membership to come out for a special presentation by the CEO of Foundation Communities and a discussion on development proposed for 11th & Trinity Street that would be the first affordable housing project proposed Downtown in over 45 years and which will include Permanent Supportive Housing. DANA board members will be looking for feedback on the design and operational proposals. This morning’s cloud cover, captured by David Gottlieb. Thanks, David! Featured in this week’s Statesman Homes section is one of my listings, and more importantly one of downtown Austin’s most unique properties. Hidden in plain view on 6th Street is a mid-century time capsule. Check out the Statesman write up here.